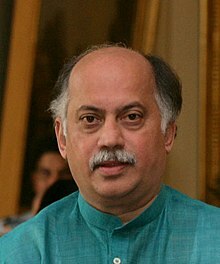 Gurudas Kamat (5 October 1954 – 22 August 2018) was an Indian politician from the Indian National Congress (INC). An advocate by profession, Kamat was a commerce graduate from R.A. Podar College, Mumbai and has a law degree from the Government Law College, Mumbai. He was a Member of the Parliament for the Mumbai North West constituency of Maharashtra in 2009 and Mumbai North East constituency of Maharashtra in 1984, 1991, 1998 and 2004. He served as the Minister of State for Home Affairs with additional charge of Minister of Communications and Information Technology, Government of India during 2009 to 2011. In July 2011, he resigned as minister. In 2013,july Kamat was appointed General Secretary All India Congress Committee and given charge of Rajasthan, Gujarat, Dadra and Nagar Haveli, Daman and Diu and was also appointed as a member of the Congress Working Committee, the highest decision making body of the Indian National Congress. In 2014, he lost the Lok Sabha Election. In 2017, Kamat resigned from all positions that he held at the Indian National Congress. Despite his insistence on resignation the Party continues to acknowledge him as the General Secretary of AICC. Kamat started his political career as a student leader in 1972. In 1976, he was appointed as the President of National Students' Union of India, Mumbai Unit. In 1980 he was appointed as General Secretary of Maharshtra Pradesh Youth Congress; in 1984, he was appointed as the President of the Maharashtra Pradesh Youth Congress; and in 1987, he was appointed as the President of the Indian Youth Congress. Kamat was appointed the President of Mumbai Congress in 2003. He held the position till 2008. In 1982, Kamat represented the Indian Youth Congress at International Convention in Bucharest, Romania. In 1986, Kamat represented International Youth Festival in Moscow and USSR. In 2003, he was a member of the four member delegation representing India at the United Nations in New York City along with Atal Bihari Vajpayee, Dr. Inder Kumar Gujral and Dr. Farooq Abdullah. Kamat represented the Prime Minister of India, Dr. Manmohan Singh, at the UN Convention at Addis Ababa, Ethiopia. In 1976, Kamat was awarded the Principal Wellingkar Trophy for the Most Outstanding Student Award at the R.A. Podar College and in 1979 was named a Fellow of Government Law College in Mumbai. In 1981, Kamat married Maharookh Kamat with whom he has one son, Sunil, who is a doctor, an intensivist and a Fellow at Sloan Kettering Memorial, New York City. Gurudas Kamat died at a private hospital in New Delhi on 22 August 2018 following a heart attack. ^ "10 Interesting Facts You Never Knew About R.A. Podar College of Commerce and Economics, Matunga". bms.co.in. Retrieved 6 June 2017. ^ "Maharashtra Civic Election 2017: Will Gurudas Kamat help BJP achieve a Congress-mukt Mumbai?". firstpost.com. Retrieved 11 May 2017. ^ "Gurudas Kamat quits all Congress posts". IANS. Retrieved 11 May 2017. ^ "Senior Congress Leader Gurudas Kamat Quits All Posts". IANS. Retrieved 11 May 2017. ^ "Sibal rejigs portfolios of Gurudas Kamat". thehindu.com. Retrieved 11 May 2017. ^ "Gurudas Kamat quits". ndtv.com. Retrieved 11 May 2017. ^ "Union Council of Ministers". thehindu.com. Retrieved 11 May 2017. ^ "Union Minister Gurudas Kamat inaugurates MIDC's First Musical Fountain". daijiworld.com. Retrieved 11 May 2017. ^ "Gurudas Kamat resigns". moneycontrol.com. Retrieved 11 May 2017. ^ "Gurudas Kamat thanks Congress for being appointed as general secretary". news18.com. Retrieved 6 June 2017. ^ "Reshuffling the old guard". tehelka.com. Retrieved 6 June 2017. ^ "Key Contestant: Gurudas Kamat". ndtv.com. Retrieved 16 January 2016. ^ "Rude jolt for Congress stalwarts in Mumbai". thehindu.com. Retrieved 11 May 2017. ^ "Congress leader Gurudas Kamat: I quit, why can't others". mid-day.com. Retrieved 11 May 2017. ^ "Gurudas Kamat, Senior Congress Leader, Dies At 63". Headlines Today. Retrieved 22 August 2018. This page was last edited on 13 January 2019, at 20:09 (UTC).